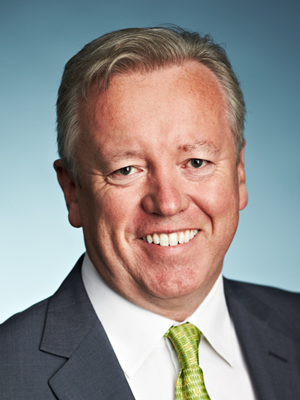 John Saunders is president and chief executive officer of FleishmanHillard, a leading global public relations agency. Saunders was appointed to the role in November 2015 – only the fourth to hold that title in the history of a firm that spans seven decades. From 2011, he held the role of regional president for Europe, Middle East and Africa (EMEA), where he had overall responsibility for the firm’s offices in Amsterdam, Berlin, Brussels, Dublin, Dubai, Frankfurt, Johannesburg, London, Milan, Munich, Paris, Prague, Warsaw and Moscow, as well as responsibility for relationships with a range of affiliate partners throughout EMEA. From 2007, he held the role of regional president for Continental Europe and Eurasia, having been named as regional director for Europe in October 2004. Before assuming his regional leadership positions, Saunders was managing director of FleishmanHillard Saunders. He founded the business in 1990 and grew it into Ireland’s largest public relations consultancy and one of FleishmanHillard’s most successful international offices. The Irish operation also won more awards than any other firm during his time as managing director there. Among clients he has advised are those in retail, property, telecommunications and textiles. These include: Abbott Laboratories, Anheuser-Busch, Ballymore Properties, Emerson, Fruit of the Loom, Mitsubishi Electric, Musgrave Group and the Sara Lee Corporation. Saunders is a member of a range of professional bodies and is regularly invited to share a perspective on communications-related topics. Countries where he has undertaken speaking engagements include: Austria, Germany, Iceland, India, Iran, Italy, Poland, Portugal, Japan, Russia, Switzerland, Turkey and the United States. In December 2007, Saunders was awarded Honorary Life Membership of the Public Relations Institute of Ireland. He was president of ICCO (The International Communications Consultancy Organisation), the global representative body for the PR industry, from 2005-2007. In 2011, he became the 15th inductee to the ICCO Hall of Fame. Saunders has also been a member of the Europe and Central Asia Committee at the World Economic Forum. He is a member of the Europe Circle of Communicators. He is also a member of the Arthur W. Page Society. He was recently appointed to the Omnicom Public Relations Group Board. Prior to his public relations career, Saunders was a staff journalist with Radio Telefis Eireann – the Irish state broadcaster. A native of Dublin, Saunders and his wife Jean have three children: Colin, Caroline and Hannah, and one granddaughter, Matilda. He currently lives in St. Louis, Missouri.